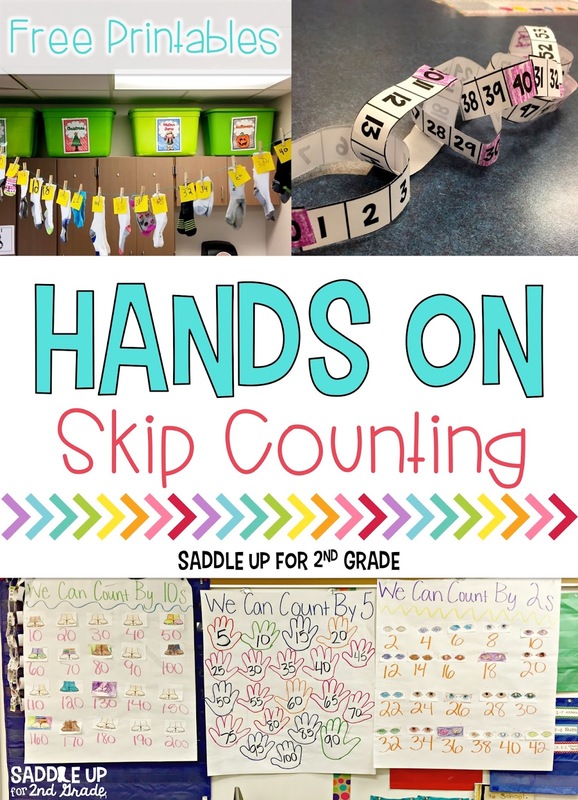 Over the past few weeks my firsties have been working hard on their skip counting skills. This is such a tricky concept for them to grasp. 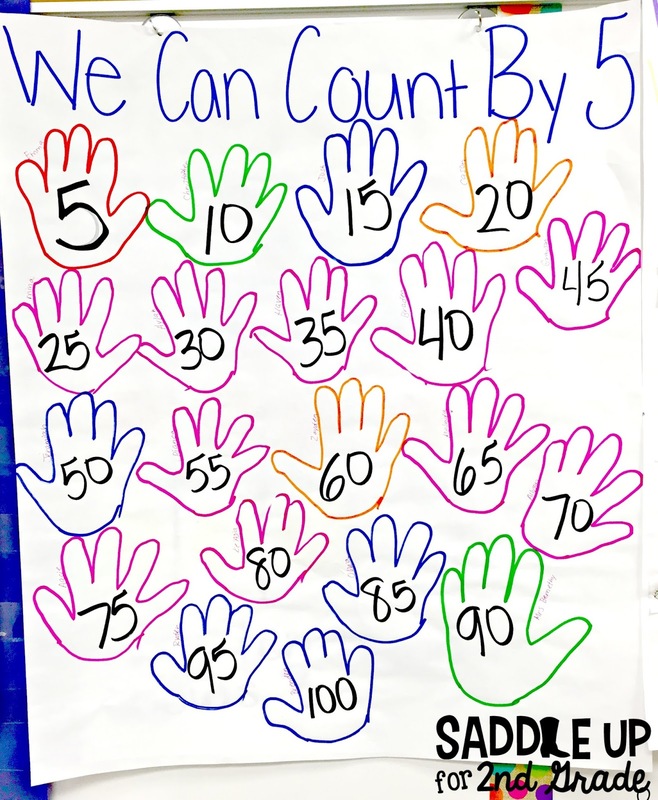 We started our week off by counting by 10s and making this anchor chart. 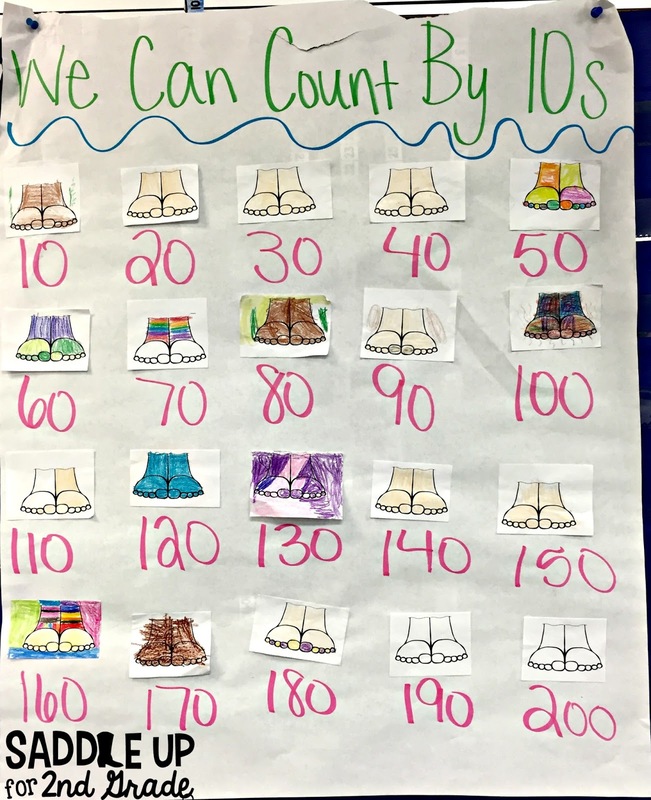 I believe that anchor charts should be student made so at the start of our day, each child got a pair of feet to represent 10. After coloring them, we glued them on our chart and them labeled them together as a class. After labeling our chart together, each child got a blank copy of a 120 chart. We quickly skip counted and colored the tens along the way. Once everyone had their chart complete, they cut it into strips of 10 and made skip counting chains. You can grab a blank copy of this 120 chart here. Once we mastered 10s, we started practicing counting by 5s. We made another anchor chart. This time, I traced each child’s hand and we labeled them together. 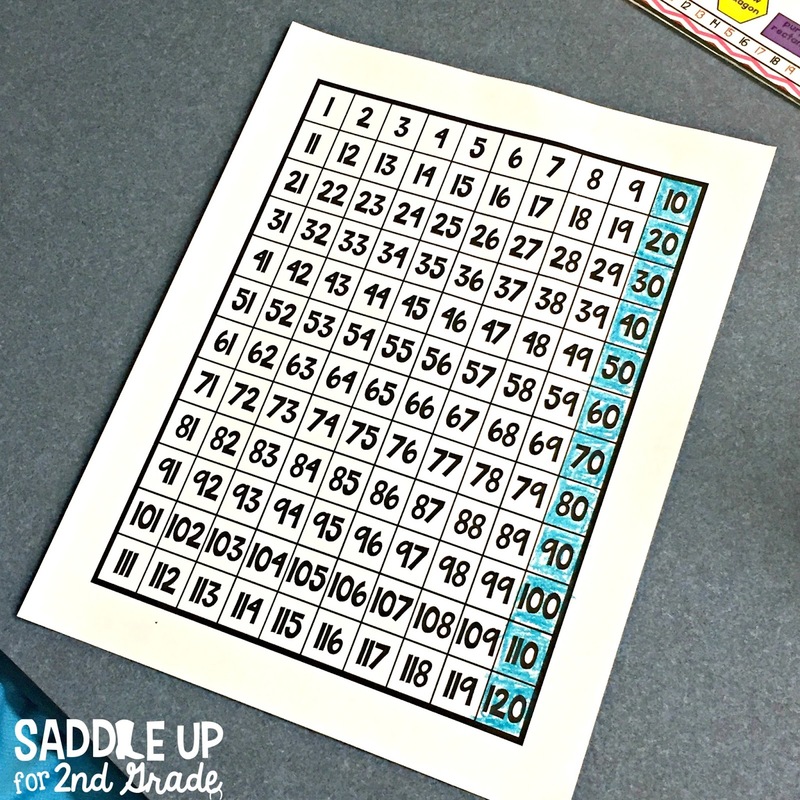 For extra practice, we made these fun skip counting hats using this printable from Smitten with First. You can grab the hand printable on her blog. 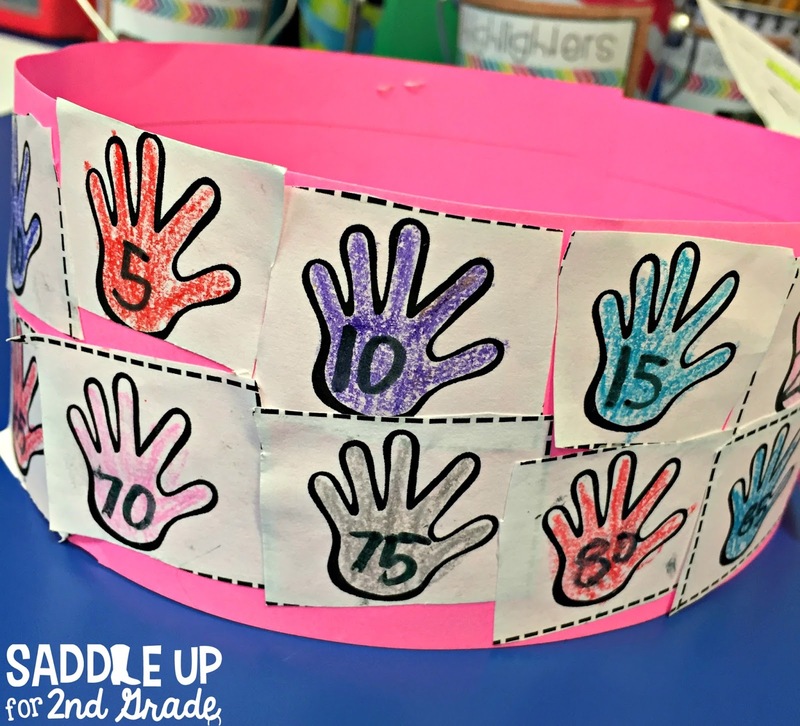 The kids counted by 5s and wrote the number on each hand and then glued them around a sentence strip to make a hat. We kept them at school all week to wear and use as a reference. Up next was counting by 2s and we all know that this is the hardest for them to get. We started out by making another anchor chart. 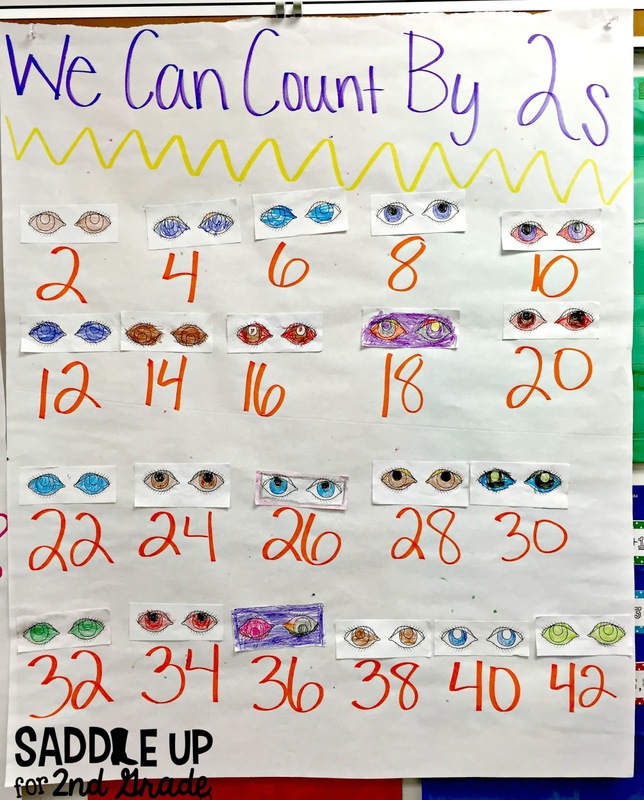 I gave each of them a pair of eyes and we labeled them together as we added them to our chart. 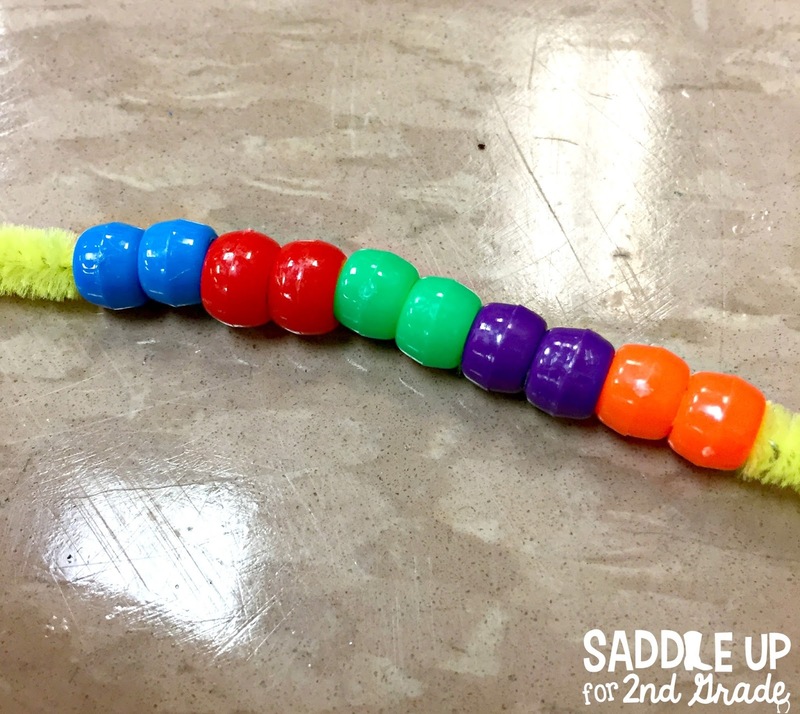 I wanted to do something really fun that the kids could relate to when counting by 2s. I came across this idea from my sweet friend Lindsay over at For the Love of First Grade and just knew I had to do it. Each child brought in a pair of socks. After discussing things that come in pairs of 2, we labeled them and hung them from our ceiling. I still have these hanging and we practice counting when we line up. This line may or may not have fallen on my head while I was trying to hang these! LOL! 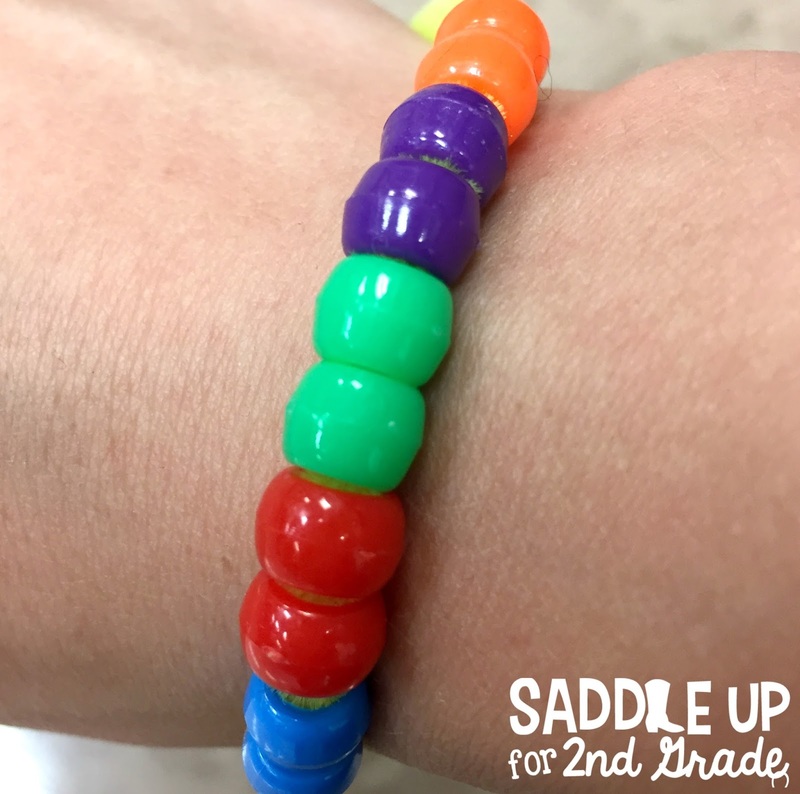 I’m all about hands on practice so we made these skip counting bracelets by counting numbers up to 20. First, they sorted each set of beads by color. Then, I let them string them onto their pipe cleaner. They wore these all week. I would ask them at random times to count by 2s. It was perfect practice. For stations, I wanted them to have some sort of activity that they could easily do to reinforce the skills that we have been working on. I grabbed a set of colored craft sticks and wrote random number patterns for counting by 2s, 5s, and 10s and they put the sticks in the correct order. 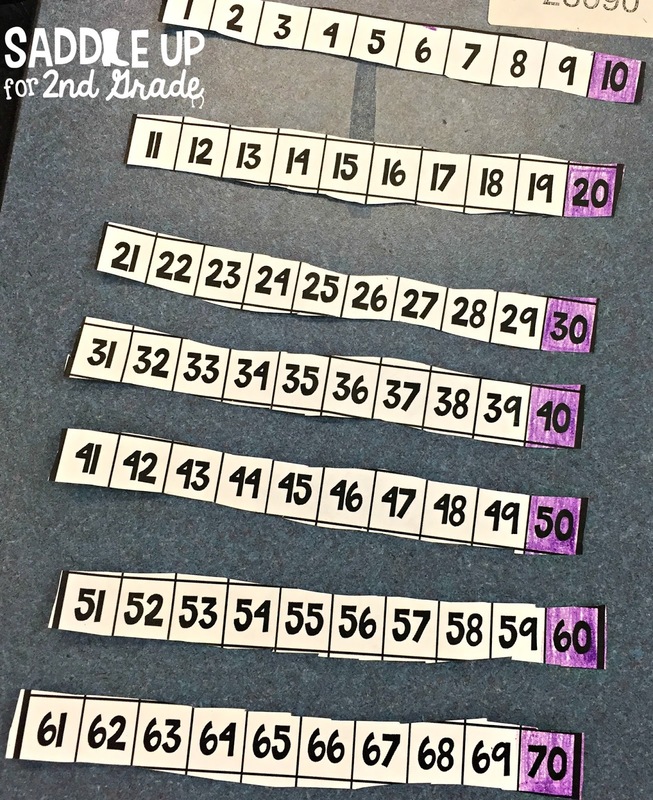 I also made a few sets for my higher kids that start at various numbers between 1-120. I always want a way for students to be able to check their work. I drew a random line on the back of the sticks. Once they’ve put the sticks in order, they can flip them over to check and see if they are right. If the lines match up they got it correct. All three anchor charts are displayed in our classroom and we reference them each day. They are perfect for a quick math warm up. You can grab the images used to make these anchor charts by clicking here. If you’d like to save these ideas for later, pin the image below. For more math ideas, check out my math Pinterest board that is full of great ideas.